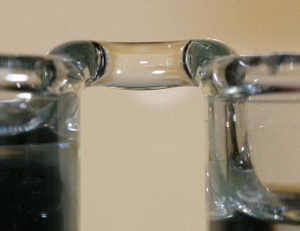 When water in two beakers is exposed to a high voltage, a floating water bridge forms between the beakers. Credit: Elmar Fuchs, et al. While it's one of the most important and abundant chemical compounds on Earth, water is still a puzzle to scientists. Much research has been done to uncover the structure of water beyond the H2O scale, which is thought to be responsible for many of water’s unique properties. However, the nature of this structure, governed by hydrogen bonds, is currently unknown. Why water would act this way was a surprise, Fuchs told PhysOrg.com. But the group’s analyses have shown that the explanation may lie within the nature of the water’s structure. Initially, the bridge forms due to electrostatic charges on the surface of the water. The electric field then concentrates inside the water, arranging the water molecules to form a highly ordered microstructure. This microstructure remains stable, keeping the bridge intact. The scientists reached the microstructure hypothesis after observing that the density of the water changes between the beaker edges and the center of the bridge. A microstructure consisting of an arrangement of water molecules could have a similar density variation. In their experiments, the scientists also discovered the existence of high frequency oscillations inside the bridge, and they observed corresponding inner structures with a high-speed camera and visualization system. Unlike the much slower surfaces waves, these high frequency oscillations weren’t caused by surface tension. Rather, the scientists predict that the oscillating structures were triggered by the waviness of the voltage supply itself. The researchers noticed a pattern with the inner structures: every experiment started with a single inner structure, which then decayed into additional structures after a few minutes of operation. The group thought that this decay might be caused by either dust contamination or the increasing temperature of the water bridge under the electric field. As the water temperature increased from 20 degrees Celsius to more than 60 degrees Celsius—which took about 45 minutes—the bridge collapsed. The scientists explain that the unusual effect of the floating water bridge, as well as the microstructures they observed during the interaction of water with electric fields, could be another piece to the puzzle of the structure of water. The group said that they are currently investigating how highly ordered microstructures may explain the density change in the water bridge, with the results to appear in a future publication. Citation: Fuchs, Elmar C., Woisetschläger, Jakob, Gatterer, Karl, Maier, Eugen, Pecnik, René, Holler, Gert, and Eisenkölbl, Helmut. “The floating water bridge.” J. Phys. D: Appl. Phys. 40 (2007) 6112-6114.